Trifonovskaya Street connects the Sushchevo district with one of the largest Moscow highways - Prospekt Mira. A tramline along this street was constructed in 1932. 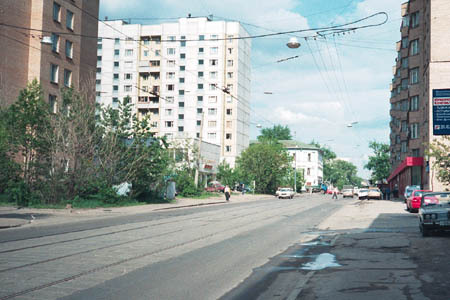 In 1995 the operation was ceased due to reconstruction of Krestovskiy overpass in Prospekt Mira. At first, it was meant to restore the operation in 1997 the reconstruction would be over, but the city transport policy changed and the tramline along Prospekt Mira was closed permanently. However the tracks in Trifonovskaya Street as well as overhead wires are still in place, and there are plans to use the line in a future (if no other reconstruction happens). 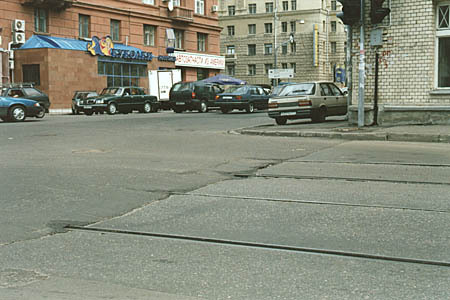 Here the Trifonovskaya Street line begins - look at tracks turning right from Obraztsova Street. A building to the left is the Moscow Institute of Railway Engineering - I graduated from this institute in 1992. The tram was operating then; it was a very busy line with tramcars full of students. The tracks had been reconstructed and relaid just in a year before the line operation was ceased. But nobody could expect such a lack of common sence. And this is a very sad view - rails leading to nothere. 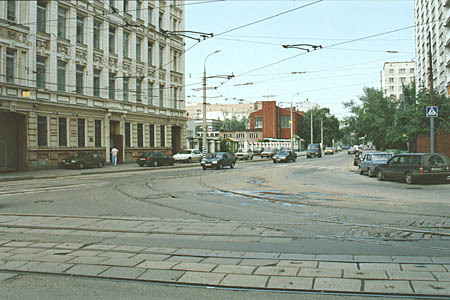 This is a junction of Trifonovskaya Street and Gilyarovskogo street - both streets had tram lines which connected in this junction and then lead along Prospekt Mira towards VDNKh. Copyright and Disclaimer. Site concept, content and design are copyright ©1999-2019 Alexander Elagin, unless otherwise stated. No text or image on this site shall be deemed to be in the public domain. Information may be downloaded for personal use only. For commercial or other usage, contact the author(s) or webmaster prior to use. All information provided on this site represents the personal opinion of the author(s) and cannot be treated as an official position of any organisation. Author(s) cannot be held responsible for content or availability of this site and external hyperlinks.